A court in an industrial city in central Kazakhstan has ruled in favor of a journalist in a libel suit filed by a major international metals and mining company. The Temirtau court on January 29 determined that online postings by Oleg Gusev about ArcelorMittal Temirtau general director Paramjit Kahlon were intended only as irreverent irony and could not therefore be deemed actionable. At first blush, the case appears to represent a rare victory for Kazakhstan’s independent media, which is routinely cowed into submission through costly lawsuits filed by officials and rich businessmen. Gusev has long been a thorn in the side of ArcelorMittal Temirtau, but the trigger for this particular case could not have been more childish and petty. 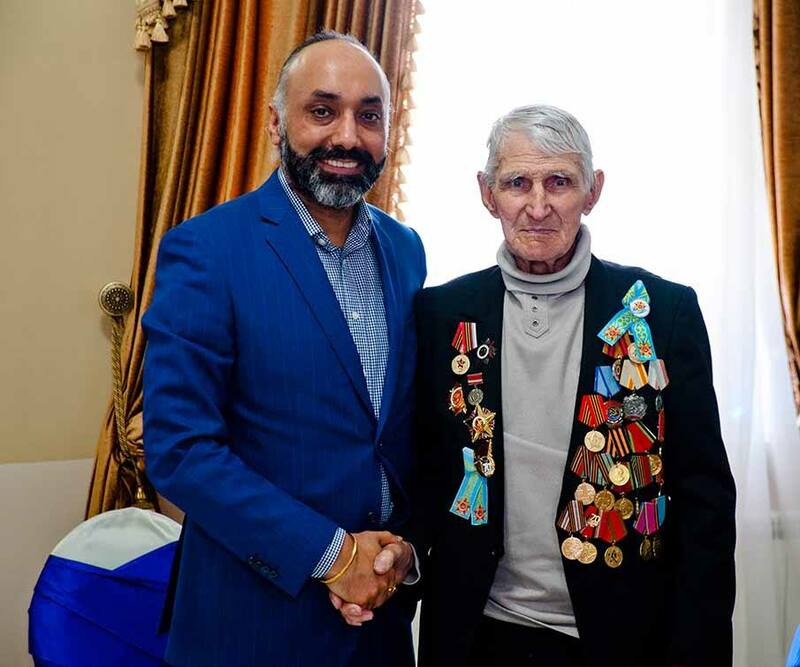 On May 9, a date that marks the anniversary of the Soviet Union’s victory over Nazi Germany, company press secretary Alexei Agureyev posted a photo on his Facebook page showing Kahlon shaking hands with a war veteran. In comments under the image, Gusev, who has written elsewhere and more seriously about what he deems to be ArcelorMittal Temirtau’s harmful practices, mocked Kahlon, describing him as a sympathizer of Nazi-allied Ukrainian nationalist militants during World War II. He used the disparaging term Banderovets — a Russian neologism derived from the name of wartime Ukrainian nationalist leader Stepan Bandera — to refer to the Indian-born executive. A few days later, Gusev went further, posting images of Kahlon alongside one of Conchita Wurst, the drag persona of Austrian singer Thomas Neuwirth, who won the Eurovision Song Contest in 2014. Gusev had fed the two pictures into an online application called Twins or Not and came up with a similarity ranking of 66 percent. After these two online stunts, patience snapped at ArcelorMittal Temirtau. The company argued that by likening Kahlon to Conchita Wurst, Gusev was making improper suggestions about the mining executive’s sexual orientation and had thereby “discredited the business reputation of the plaintiff.” Suggesting that Kahlon, who formerly headed an ArcelorMittal subsidiary in Ukraine, was a supporter of Bandera was also an insult, the company said. A psychological and philological expert gave testimony in the Temirtau court to argue that there was no evidence to support the miner’s claims, however. Gusev has said that he believes the libel case was a reprisal for the reporting he has done about ArcelorMittal Temirtau’s damaging impact on the environment. The antagonists may be set for another round in the courts. In October, police revealed that they had opened a criminal case against Galymzhan Kunakbayev, a senior executive at ArcelorMittal Temirtau, on suspicion of unlawfully obstructing Gusev’s professional activities. Gusev claims that Kunakbayev threatened to cancel a deal with an ArcelorMittal Temirtau contractor that employs his son-in-law as a form of intimidation. The investigation is still ongoing. People in the independent media scene have said that Gusev’s case could serve as a valuable precedent by upholding the position of a journalist against that of a major industrial concern. The optimism may be overstated, however. It is suggested in some quarters that the ArcelorMittal Temirtau libel case may actually really be part of a larger and unseen squabble among business and political elites. That would make the significance of the case less to do with media rights than politics. The real breakthrough would, for those concerned with the viability of a free press, be to see a change in libel laws and the creation of a more level playing field for non-state-funded outlets.